When choosing a collection container for food waste, the most important question to ask is how the food waste will be collected at the curbside. Is your collection model automated or manual? Once that is determined, there are a few key features that should be considered when reviewing collection container options. While most key characteristics of a food waste collection container are basic functional requirements, there are also plenty of design details that should be considered between the various models of collection containers available today. Below are some key functional design characteristics that should be reviewed when selecting your food waste collection container. Vented lid design on kitchen container with sealing ring shown along the outer rim. Lid design is important since it is the primary point that seals the container shut; therefore, it is the biggest deterrent to the “ick” factor related to odors and pests. Whether the container is for indoor or outdoor food waste collection, the design should always incorporate some sort of sealing ring. The sealing ring is where a raised lip from the base of the container can fit into a groove in the lid. This ensures that even if the lid is not latched to the base of the container, there is still some passive method of blocking the food waste odors from exiting the container. Having a sealing ring also allows for the container to be custom-fitted with a rubber gasket for those who want a supremely sealed container. Lids can be solid or vented. Vented lids are ideal for interior food waste collection containers, or kitchen collection containers. Venting on a collection container allows moisture to escape the container and, therefore, slows down the decomposition process. By slowing down decomposition you are also reducing the odor associated with decaying organic material. Most homeowners have the perception that the venting will allow odors to escape into their home; however, in fact, it assists in preventing the odors from occurring in the first place. On the other hand, an exterior food collection container should have a solid lid. This will keep the food waste protected from the elements (rain and snow) as well as keep the food waste odors from luring pests such as racoons. In terms of collection, lids should be designed so that they are hinged to the container and swing directly to the back of the container. 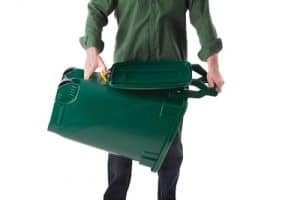 A valuable design feature would allow the lid to be held down while holding the base of the container making it an easy one-handed dumping action and preventing the lid from swinging back and forth when emptied. 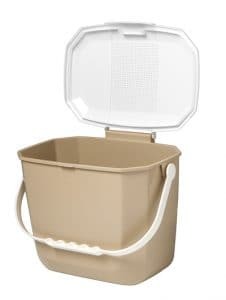 This keeps the lid free from inadvertently trapping some of the food waste in the container and also keeps operators safe from pinch points at hinges, and from lids swinging towards them. Curbside collection container lid being held back securely while emptying. Handles are essential. A simple handle is required for the kitchen collection container to allow it to be easily carried from the house to the exterior collection container. Additional handles on the kitchen container can be placed strategically to assist with holding the container when emptying the contents. Everyone handles a container differently when carrying and emptying, so placing various handles or hold points on the container may help the user handle the container with more ease. With that consideration in mind, whether there are one or many handles on the kitchen container, they should never impede opening, closing or any functional part of the container. Handles for the exterior collection container are much more important, especially if the curbside collection container is emptied by hand. Handles need to be placed on the top of the container to allow a resident to push or pull the container to the curbside. They also need to be placed on the bottom of the container in order to assist the operator in lifting and dumping the container into the hopper of the truck. 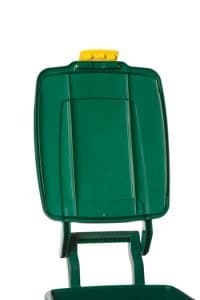 A retrieval handle on the bottom of the container is also convenient for retrieving the container in cases where the operator drops the container inside the truck’s hopper. For manual collection curbside containers, these handles need to be able to accommodate the space required for heavy-duty work gloves and need to be placed on several sides of the container, so that left or right-handed operators can easily emptied the containers. The universal usability of a collection container is very important for several reasons. If a kitchen or curbside collection container is difficult to handle, to maintain, or to use in any way it can immediately deter a resident from using it and, therefore, discourage them from actively participating in a food waste diversion program. It can cost a municipality or hauler a good deal of investment to have to continuously maintain or replace containers that break or lose their collection function too quickly. It can also cause delays in collection routes and strain or injuries on collection operators. Simply put, using any food waste collection container should be easy. Indoor containers should be easy to handle, easy to open, easy to close, easy to empty and easy to clean. Most of this can be guaranteed by ensuring that the container is designed in such a way that all these tasks can be done using a one-handed operation. It should only require one hand to open and shut, one hand to empty and one hand to carry. This design features touches on the ease of use of the container as well as any accessibility issues that a user might have. A resident should never be fumbling in the kitchen to open the container while preparing a meal or fumbling to empty their indoor container into their exterior container while outside on a cold winter night. The kitchen container needs to be the easiest to use for food waste collection because it is the most frequently used container for food waste collection. It will be opened more regularaly and emptied more often than the curbside collection container. Outdoor containers need to be made for outdoor storage of food waste and for collection. This container needs to be securely fastened or latched but also easy to open by a resident, operator or by automated truck movements. Latching or locking designs need to be intuitive and should not require much instruction or installation. The outdoor container also needs to be easy to move from one location at a property to the curbside for collection. Considerations should be made for the height and width of the container as well as for wheel design. Solid lid design on curbside collection container showing sealing ring on outer rim of the lid. Indoor collection containers should be designed to only have a maximum of 3 gallons of fluid capacity—2 gallons is preferred. This ensures it cannot fit more than 10lbs. of food waste. There are a few reasons for this capacity restriction. It will increase the frequency that a homeowner will empty the contents into their outdoor container and prevents the “ick” factor of collecting and storing food waste in the kitchen. You minimize the opportunity for that food waste to sit too long and then begin to decompose, creating smells in your home. Most kitchen collection containers are not designed to hold more than 10lbs of food waste as some residents prefer to mount their kitchen collection containers on cabinet doors for easy access and storage. Outdoor container capacity could be anywhere from 11 gallons to 95 gallons depending on the method of collection at the curb. If used for manual curbside collection, the outdoor collection container should be no larger than 13 gallons in capacity so as to prevent the filled weight being over 55lbs. When using an automated collection model, outdoor collection containers can vary depending on the frequency of collection and the decision whether to include yard waste as well. In a collection program that already gets a great deal of criticism from residents, the easier the container is to maintain and keep clean the better it is received. Any container used in food waste collection should be smooth inside and outside and free of as many folds or crevices as possible. This makes the container easier to clean and keeps food waste from getting stuck inside the containers. This also reduces the likelihood of food waste build up in unmaintained containers, which can create a good deal of attention from pests and generate odors. Material used in the manufacturing of either interior or exterior containers should be solid and strong. For plastic collection containers the material of choice is polyethylene. This material is rated for extreme temperature changes and repeated stress. It can withstand the rigors of any environmental changes and physical stressors. Polyethylene is also extremely resistant to chemical cleaners, making it a great choice for containers that may need to be continuously rinsed or washed to remove debris. The success of any food waste collection program relies on buy-in from the local government and from the residents. Without this, most collection programs may not make it out of the planning stages. While collection containers are a small part of any food waste diversion program they are an integral part of the program. They can save a food waste program money from the immediate or the long-term budget and they can also help to influence participation from residents. Ashley Clark is the Sales Manager for Nova Products Environmental Division (Fort Erie, ON). Nova Products designs and manufactures collection container for recycling and food waste collection programs. Ashley can be reached at (905) 871-4766 or via e-mail at Ashley@novaproducts.ca. For more information, on Nova’s recycling and food waste collection products, visit www.novaproducts.ca.